The untold story of the movement that came close to keeping the United States out of the First World War. This book is about the Americans who tried to stop their nation from fighting in one of history's most destructive wars and then were hounded by the government when they refused to back down. In the riveting War Against War, Michael Kazin brings us into the ranks of the largest, most diverse, and most sophisticated peace coalition up to that point in US history. They came from a variety of backgrounds: wealthy and middle and working class, urban and rural, white and black, Christian and Jewish and atheist. They mounted street demonstrations and popular exhibitions, attracted prominent leaders from the labor and suffrage movements, ran peace candidates for local and federal office, and founded new organizations that endured beyond the cause. For almost three years, they helped prevent Congress from authorizing a massive increase in the size of the US army, a step advocated by ex-president Theodore Roosevelt. Soon after the end of the Great War, most Americans believed it had not been worth fighting. And when its bitter legacy led to the next world war, the warnings of these peace activists turned into a tragic prophecy, and the beginning of a surveillance state that still endures today. War Against War is a dramatic account of a major turning point in the history of the United States and the world. "[A] fine, sorrowful history...Kazin's work is an instructive one, an important book in chronicling a too often neglected chapter in our history. Most of all, it is a timely reminder of how easily the will of the majority can be thwarted in even the mightiest of democracies." "[A] much-needed book for this anniversary season...[Kazin] paint[s] a full and nuanced picture of the surprisingly diverse array of Americans who opposed the war." "Kazin, a history professor at Georgetown and editor of Dissent, brings a fascinating perspective to the war that is still known as the Great War. He focuses on Americans who advocated for peace...Kazin paints a portrait of the diverse coalition of realists and idealists who sought, instead of resorting to military force, to create a new global order...He convincingly argues that the U.S. decision to join the Allies was a turning point in history and one that reverberates today—including in the form of the 'surveillance state'..."
"Kazin chronicles the antiwar movement in America during World War I. Embracing all classes, religious beliefs, and ethnicities, these resisters launched demonstrations and ran peace candidates in an effort to keep America out of the war. Kazin argues that, with the retrospective sense of many that the fighting wasn’t worth it and led to the tragedy of World War II, the antiwar movement was prophetic. And he sees its very existence as ultimately kicking off the idea of a surveillance state." "For Kazin, the heroes of the pre-WWI period were those who strived to prevent U.S. entry, and he pays eloquent tribute to a diverse coalition of peace activists, including feminists like Crystal Eastman, socialists, progressive politician Robert La Follette, Henry Ford, and even a staunch segregationist, House majority leader Claude Kitchin...the courage of those who opposed the war is given proper recognition in this passionate account." 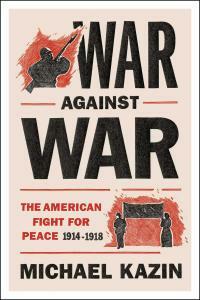 "Michael Kazin's War Against War confirms his stature as one of the most astute historians of the American 19th and 20th century social movements. Equally significant to readers is that the lessons contained in his new book are presciently relevant. Read along with his earlier The Populist Persuasian: An American History, it would serve as a manual for resistance to war in the coming years." "[War Against War] is well-written, carefully researched, and compelling scholarship. A dramatic read, this work expounds in detail on critically important parts of American history that tragically have gone forgotten and unlearned." "War Against War’s great strength is in laying out the pitfalls and fractures the pacifist movement confronted...while showing how it created a strong enough base, and a powerful enough critique, to push back against U.S. entry for three years." "Kazin ends War Against War with a salute to those who search for peace. He deserves praise for portraying that quest with clear-eyed honesty and rigor. Maybe that kind of clarity could help keep us out of wars to come." "[Kazin] expertly conveys the complex and electric prewar political landscape, and the constellation of reasons that many Democrats, Republicans, Socialists, farmers, feminists, left-wing trade unionists, segregationists and liberal immigrants had for banding together in this common cause, and then for breaking apart again." "[Kazin] brings a fascinating perspective to the war that is still known as the Great War [and] convincingly argues that the U.S. decision to join the Allies was a turning point in history, and one that still reverberates today." "War Against War is a convincing warning about the falsehoods and self-deception that drew us into WWI and later into Korea, Vietnam, Iraq and Afghanistan."